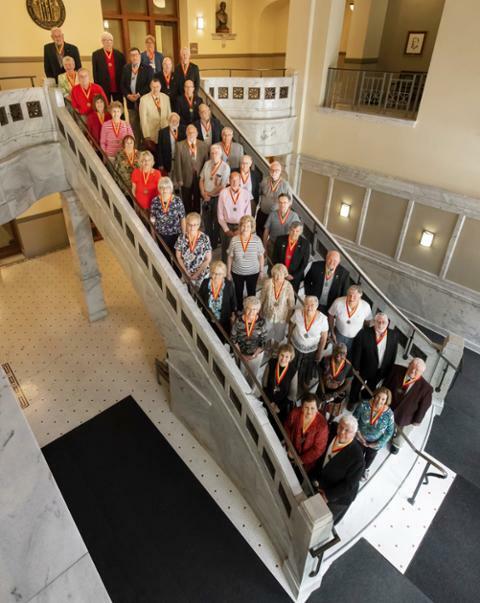 Are you an alumna/alumnus of Pittsburg State University Class of 1969? Your 50th anniversary reunion is this year! We invite you and your spouse/guest to celebrate on campus on May 9th and 10th! A number of activities are planned, including campus tours, other customized activities, and a special program, dinner, and dance on Thursday evening. Live musical entertainment will be provided performing hits from the 1960s. It is going to be a great evening full of fond memories, delicious food, and wonderful music. On Friday, attendees will be inducted into the Half-Century Club during a lunch hosted by PSU President Steve Scott. That evening, there will be an opportunity for members of the Half-Century Club to don regalia, march in the processional, and be recognized as a group during the spring commencement ceremony. See below for a short video highlighting previous year’s events. If you are NOT a member of the class of 1969 and would like to attend the Thursday Night Dinner and Dance or the Half-Century Luncheon, please register below. Overman Student Center, Crimson & Gold Ballroom, for the Class of 1969 and their guests and others. Enjoy breakfast with President Scott and his wife Cathy Scott. Location TBD. Additional guests include previously inducted members of the Half-Century Club, deans, vice presidents, faculty and staff. If guests do not want to tour campus and Pittsburg on the bus, they will be transported back to the Wilkinson Alumni Center following the class picture. The bus will leave from Russ Hall. 5:00 pm CLASS OF 1969 participating in commencement will ride the bus to the Plaster Center to receive regalia and prepare for the processional. Please wear Half-Century Medallions. Spouses and guests are invited to sit in a reserved section in John Lance Arena and will meet in this same location. 5:15 pm CLASS OF 1969 line up to march in commencement. Family escorted to special seating. Bus transportation provided to and from commencement. Note: A black graduation gown is provided for the class of 1969 participating in commencement. Please make reservations as soon as possible. *Blocked rooms and discounted rates. The PSU Office of Alumni & Constituent Relations does not guarantee prices. Inform the hotel you are attending the PSU Half-Century Reunion when making your reservations for a discounted rate and blocked rooms, if available.